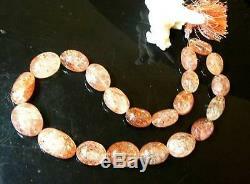 RARE NATURAL SPARKLING SUNSTONE BIG NUGGET BEADS 422ctw 15.5 FULL STRAND 15-25mm. 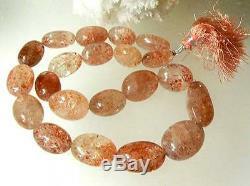 AMAZING QUALITY TRANSLUCENR OREGON SANSTONE BIG OVAL BEADS!! The sunstones measure 15-25mm long x 11-18mm wide x 8-12.5mm thick! 21 RARE NATURAL UNTREATED SUNSTONE BEADS IN THE STRAND!! TRANSLUCENT, WITH AMAZING SPERCLES INSIDE!! Beautiful glittering sunlight effect as a result of tiny ORANGE RED DEPOSITES!! 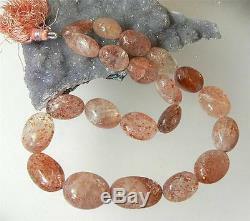 POLISHED NATURAL SUNSTONE OVAL BEADS FROM OREGON!! THE SUNSTONE OVAL BEADS LOOK 200% BETTER IN PERSON!!! Perfect for a lot of your design project!! I HAVE GREAT SELECTION OF STANDARD FORM AND UNIQUE GEMSTONES AND FRESHWATER AND TAHITIAN SOUTH SEA PEARLS!! 5 0 for each additional item ships in the same package (must be paid together). 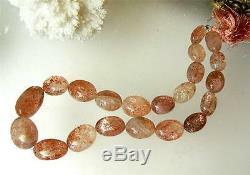 The item "RARE NATURAL SPARKLING SUNSTONE BIG NUGGET BEADS 422ctw 15.5 FULL STRAND 15-25mm" is in sale since Sunday, November 10, 2013. This item is in the category "Jewelry & Watches\Loose Beads\Stone".